Technically, the term “spinal extension” refers to the spine returning into the neutral position from flexion (1) and bending backwards (2). But the term “extension” also means lengthening. 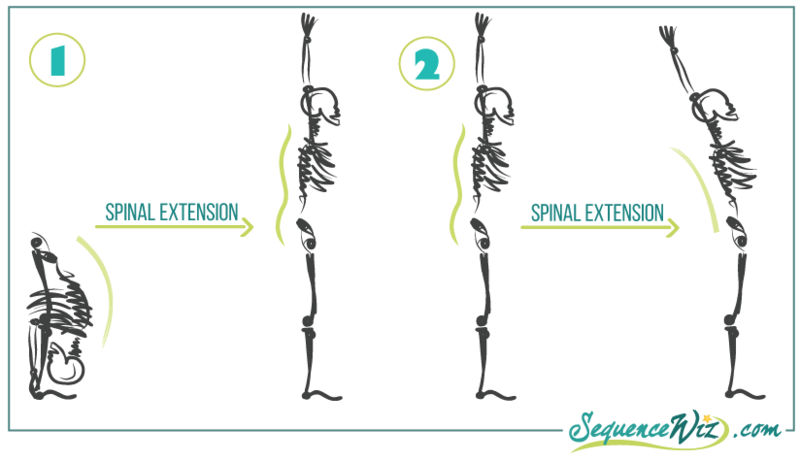 So when we say “axial extension poses”, we mean that the main goal of those poses is to lengthen the spine along its axis. As we mentioned before, it is NOT our intention to flatten the spine, but rather to create some space between the vertebrae to counteract the effect of gravity. This type of classification is not very widely known, but it is very useful both in understanding what the pose is for and how to do it. The most important aspect of all axial extension postures is to bring the spine into maximum vertical alignment while integrating all the spinal curves without strain. This type of action builds strength and elasticity in the postural muscles, helps to strengthen the core and promote overall structural integration. The secondary intention of the axial extension poses is to stretch the arms and legs away from the torso, facilitating the lengthening of the spine and creating space in the shoulder and hip joints. This type of action helps to stretch and strengthen the muscles that bind the arms and legs to the spine and improve peripheral circulation. 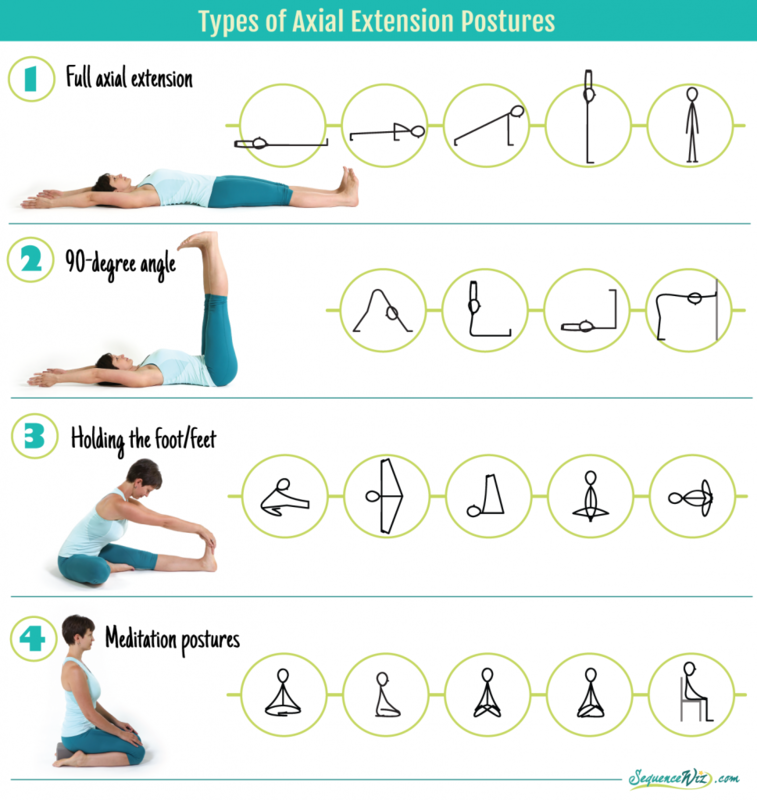 Here are the four major groups of the axial extension poses. Group 1 includes the poses where the torso and legs are straight and extended. Here the axial extension of the spine is the most important element. 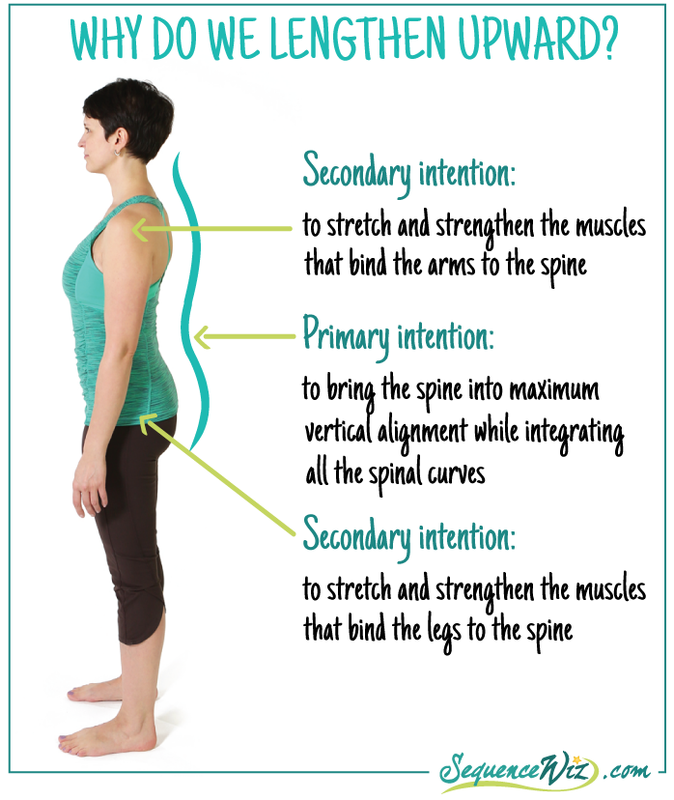 Depending on the body’s position in relation to gravity, it might require strong abdominal support to maintain the integrity of the spinal curves (in Chaturanga Dandasana and Plank pose). Group 2 consists of poses where the torso is held at 90 degrees to the legs. This might make you wonder – isn’t this a forward bend then? It certainly has the elements of the forward bend, but the goals here are different. In forward bending poses our main goal is to stretch the lower back, while in those poses our main goal is to lengthen the spine and the secondary goal is to stretch the shoulders. That is why we put those poses into the axial extension category. Furthermore, because of the extended arms, all of those poses have an element of back bending in the thoracic spine (since here we are trying to pull the chest away from the navel). In Group 3 poses you hold on to your foot/feet making those postures fixed-frame, which means that the body forms a closed loop. Here your arms and legs have a fixed position and are used to generate leverage. Fixed-frame postures are generally more challenging and more intense because of the leverage. Holding on to your feet is also more likely to pull your spine out of proper alignment if your hamstrings or your inner thighs don’t have much give. That is why we often adapt those poses by placing the hands on the knees, for example, since the proper position of the spine is our priority in any pose. Group 4 includes all meditation postures. Here the extension of the spine is the primary goal; however, it has a completely different quality than in other pose groups. Instead of creating maximum spinal elongation, we are more focused on creating a balanced position in which the spine can be held comfortably without strain for extended period of time. That way, instead of focusing on body discomforts we can direct the mind inward toward the breath and meditation. We all know that this is no small feat. So often we will spend the entire practice preparing the body for one of those seemingly simple, but in reality quite challenging postures. 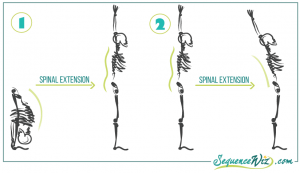 Because of the difference in the way we lengthen the spine, there are two distinctive ways of performing axial extension postures – one that focuses on bringing the spine into maximum vertical alignment, and another one that focuses on integrating all the spinal curves without strain. We will compare those techniques next week. Tune in! In group 1 position 1 I would suggest adding the same posture prone. I call it the “flying carpet” (do you know the sanskrit?) and use it before cobra as a slight stretch/warm up. It feels lovely and I have been working on a slight hover. 😉 Spinal extension without changing spinal curves has been a mystery for me, so I am eagerly awaiting the next installment! I hope someday that all of your blog posts will be put into a book?! I learn so much, and would love a hard copy to read, re-read, dog ear, etc. . . Thanks for the explanation of extension! I am a huge fan of your teaching methods and I regularly share them with students. As a former IT analyst who enjoys the technical aspects of things, I appreciate your excellent presentations. Your depth of knowledge is admirable! I also hope that you write a book (or two) and compile all of this material. I am sure it will be a best seller! Next story New Image Editor for yoga poses is here!